After 4 weeks of snacking, drinking fizzy, and stuffing my face with delicious Spanish food while away on holiday, coming back to my diet was hard. The actual healthy eating is not what I am talking about. I mean the decision which you make when you decide to go back to being healthy, and sticking to it is the problem. This is because when you are out of your usual routine, it is almost too easy to snack on something which will automatically make you feel like the day’s good work is ruined anyway, so you might as well carry on munching. I managed by cooking up something special to remind myself just how tasty healthy food is, and how good it makes me feel. Begin with cutting the aubergine into 3 thick slices, it can be difficult to find a small aubergine so in that case use half, aim for about 1cm thickness. Fry the aubergine on a frying pan on heated oil, and once slightly browned transfer onto a baking tray, unless you have an oven suited frying pan. 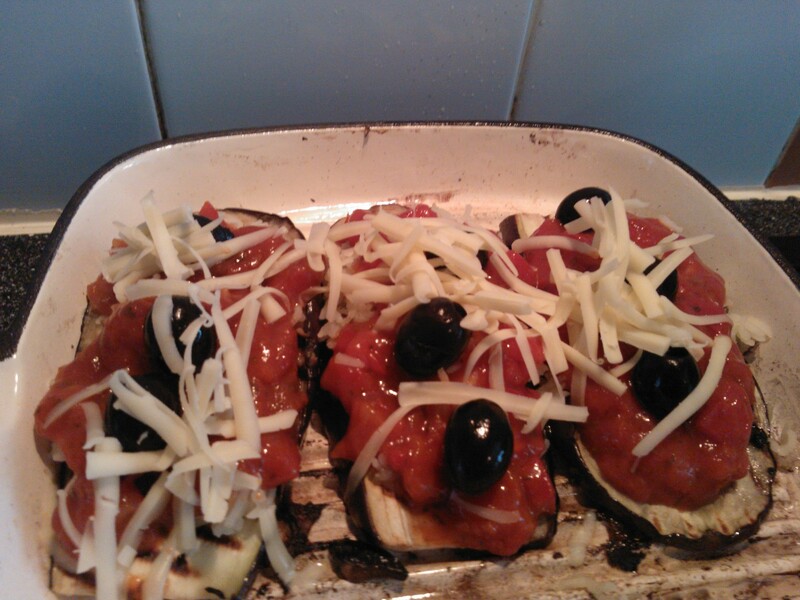 Spoon an equal amount of cooked rice on top of each of the aubergine slices. Evenly spread the pasta sauce on top of the rice and place the olives on top, finishing with a sprinkle of cheddar. Bake in the oven for about 15 minutes on 220 degrees, once the cheese is melted it is ready! Calories – the prepared potion all together adds up to 600kcal which is good for something which tasted very much like pizza. I served mine up with some simple salad leaves, cucumber, tomato and onion. 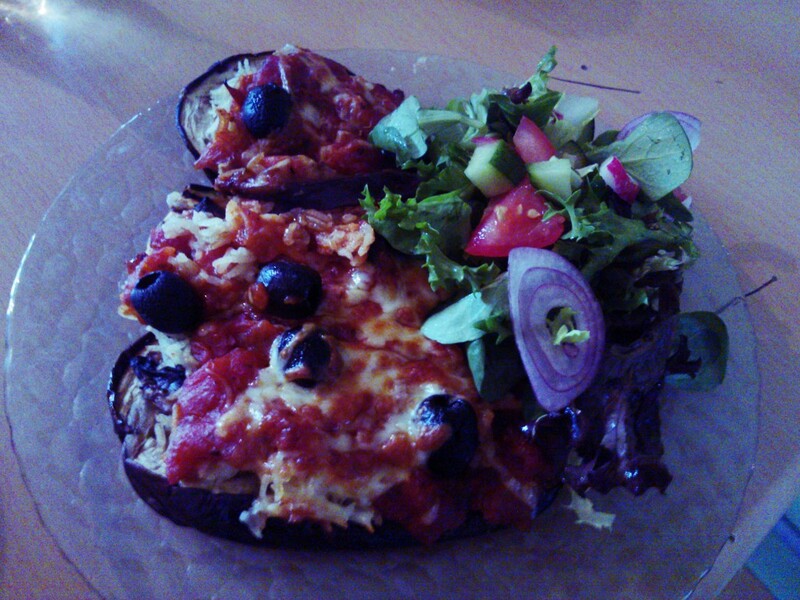 This entry was posted in Inspiration, Recipe and tagged Aubergine, calories, diet, food on June 17, 2013 by hellotummy.